Greetings everyone, just got my KryoFlux last week and I dug up my giant stash of Mac 400K, 800K, and 1440K floppies from the early to mid 90s. I was wondering, what format and/or settings changes do I need to choose in order for my KryoFlux to properly save the info on them? The closest thing I see is Apple DOS 400K/800K, but I am also dealing with 1440K disks, and AFAIK Mac OS was never called Apple DOS, I thought that was only on the Apple ]['s. Re: How do I properly save Classic Mac floppies? Thanks for the link brightcaster. I read the whole thread but didn't really understand what I needed to use. I did try copying several 400K/800K disks using the "Apple DOS 400K/800K" setting (everything at defaults), but for some odd reason every single disk supposedly had a bad sector at track 48, side 0. I don't believe this, since I saw this with a good handful of disks. I tried two drives, a Sony MPF920 and a Panasonic JU-256A216P, and both stopped in the same spot. Both drives have a maxtrack of 83. Do I need to buy other drives to dump these disks with? Is there some setting I'm missing that's causing this to happen? I checked on the Internet Archive for dumps made by other people, but I couldn't see any settings they used looking at the logs. And, by the way, 1440K disks were dumped successfully using MFM at default settings. I'm using Windows 7 32-bit with the GUI version of KryoFlux. A single sector at track 48, side 0? I'd think copy protection, but not on every disk. Could you post a sample dump? Are these program disks or user-formatted data disks? If these are data disks, were they perhaps recycled former program disks? Different 3.5" drives can have varying results reading since PC floppy drives were never designed for GCR or variable bitrates. But from my experiences, what happens in an incompatible drive is a large number of either inner or outer tracks are unreadable. A single sector in the middle suggests something else. And, I don't know either why they called it "Apple DOS", although the same low-level format is used on Apple II 3.5" PRODOS disks as well as the Apple Lisa. Yes, 1.44mb disks are the same low-level format as IBM PC disks, just a different file system. Even a lobotomized USB floppy drive and WinImage can image those, although they can't show you files. A single sector at track 48, side 0? I'd think copy protection, but not on every disk. I wish it was just a single sector, most of the time it's not the case. Just, for some reason, the bad sector(s) begin at track 48, side 0. Copy protection is a good thought, but even on a shareware disk this was the case. I didn't mention that other sectors after that had issues too because it took such a long time with track 48 I decided to give up most of the time (those times I did have the max no. of retries set to 50). I didn't make the connection in my head. I apologize for not mentioning that sooner. Could you post a sample dump? Sure. The two disks I provided dumps of are Links Championship Course - Firestone Country Club Championship Course - Disk 2 and SHAREWARE SYSTEMS - DISK: MG00005 - MAC-GAMES - Mountain of Mayhem, both in "KryoFlux stream files, preservation" format, all default settings, dumped using the GUI under Win7 32 bit. One thing interesting to note is that the disk 1 of Links Championship Course was a 1440K disk that imaged over just fine. That dump was performed on the Sony drive. The link contains 7zipped archives of raw streams I made using both drives. Are these program disks or user-formatted data disks? If these are data disks, were they perhaps recycled former program disks? Both disks, and all the 400K/800K disks I've tried copying so far are all program disks. Interesting to hear about the 1440K disks, that they can even be written back using USB floppy drives and WinImage. It was a long time ago, but I remember writing disk images to disks using "dd" on my Mac and having mixed success, probably good results with 1440K images and bad ones with 400K/800K images (all were being written to 1440K disks). From the histogram view all tracks look decent, tho it's not apparently very clear at first, but you can inspect the data more closely using the scatter plot in the GUI. Shareware systems disk actually has few bad sectors at the last tracks, visible as the three bands having these vertical spikes bleeding between the bands. But both disks have random noise on the inner tracks around the two lowermost bands (you should be able to emphasise this using the +/- keys on the scatter view), more on the Sony than on the Panasonic, which makes me think if the drive electronics have something to do about it. I've dumped some Macintosh system disks using random drive and those have come out ok.
Ok, those do look like drive compatibly problems. There are boundaries at track 16, 32, 48, and 64 where an Apple variable bitrate disk switches to a lower density. So failure to read tracks below (or above) one of these bounders indicates a compatiblity problem. I use a Teac FD-235HF with fairly good results. I don't believe there is a compatiblity list anywhere. Although it typically won't make any difference, you might just check your density line setting. For low density disks in typical drives it should be set to logic level "high". Most 1.44mb drives ignore the density line input, but I do have one drive from an IBM system where that actually overrides the density notch. How would I do this exactly? Is that a hardware or software thing? Over the weekend I purchased a handful of floppy drives off of eBay. This afternoon I received two drives; still waiting for more to come in. They are a Teac FD-235HF (maxtrack=81) and an Epson SMD-300. I tried out both disk 2 of Links Championship Course and the shareware disk on the Teac and they both imaged nicely. The shareware disk tripped up a little bit in one spot, but amping up the retries to 50 and revolutions to 10 got it to eventually read okay. Contains both disk 2 of Links Championship Course (default KryoFlux GUI settings) and the shareware disk (retries=50, revolutions=10, rest are default KryoFlux GUI settings). One thing I noticed is that when I converted the stream files to images, the shareware disk marked one sector as bad. This makes sense, as it was the problematic one, but when I had it saving to a 400K/800K Apple DOS .img, the retries got it to read successfully. This lead me to noticing that in the list, there is an option to use a format-guided stream copy. Should I choose this next time to guarantee that I also get a good stream? I also haven't tried out my Epson drive yet, only because I'm confused on what to do with the jumpers on it (yes, it has jumpers). I thought I read somewhere here that there were certain steps involved in dealing with drives with jumpers but I couldn't find that anywhere on here. My apologies if this post is all over the place or doesn't make much sense, I'm typing this late at night and I'm kinda tired. In the GUI, the density line setting is at the bottom of the "drive" menu. Logic high=low density logic low=high density. On the command line, that is the -dd option. Preservation stream dumps keep 5 revolutions of data. If it did not get a good read for a sector it will always show bad. I might be mis-remembering but I think format guided only store one revolution - but with Macintosh disk you really need to keep all five revolutons. But format guided does retry and will keep only successfull reads unless the it exceeds the maximum retries. When you have jumpers, you just have to find the manual for that model and look up what they are for. That sound file sounds more or less ok. Some drives simply step louder than others. I can give the density setting a try this weekend, I'm just reporting my findings so far before I go to bed. 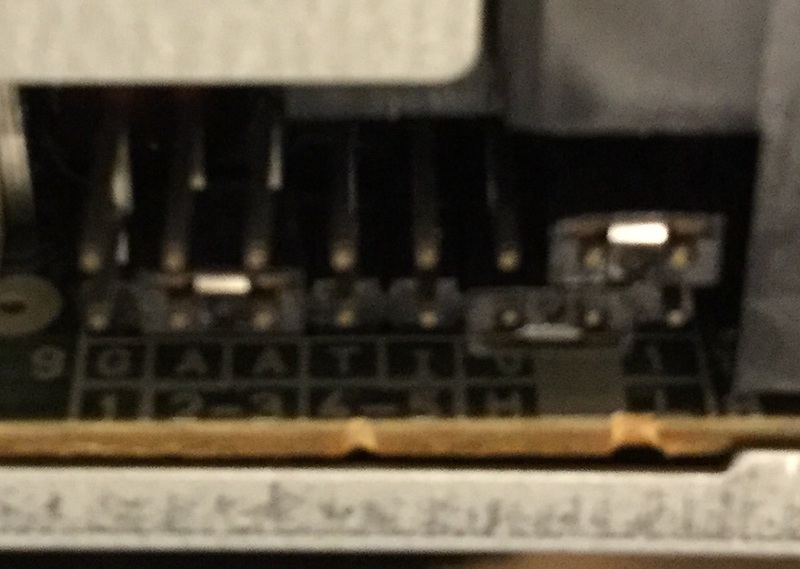 I looked online and found little to no information regarding the jumpers on the SMD-300. Quite reassuring, I know. I read that with the SMD-340 the jumpers had something to do with the drive being either drive 0 or drive 1, which I find strange given that this is only a floppy drive. I just left the drive jumpers as is, which I believe is equal to drive 0, and gave it a go on my KryoFlux. I began imaging the shareware disk as a 400K/800K Apple DOS image and, to my surprise, the drive does work, however it supposedly thinks there are bad sectors in the very beginning of the disk (side 0 track 2), which I don't believe. I only let it go on a bit longer before I just stopped imaging. While it was imaging, it would find a "bad" sector, but all it would take were one or two retries and the drive could read it again...until it got to track 48. Same problem as the first two drives. My luck, right? Research online leads me to believe the Epson SMD-300s were used primarily in Atari ST computers, so I wonder how those disks would fair with this drive. Sadly, at the moment I do not own an ST, nor do I own any disks for it to test this theory . I'd like to hear some input from the KryoFlux devs regarding this. I really would like to use the format-guided option if it will allow for some kind of error correction, but also saving the 5+ revolutions of data. Currently I'm waiting for a Samsung SFD-321B (rev. S2) to come in the mail. Hopefully that will help with something. I read somewhere on the forums somebody had good results imaging 1440K disks with those drives. Which reminds me, before all of this 400K/800K mess, I had imaged about fifteen 1440K Macintosh disks using the Sony drive mentioned earlier, and those (for the most part) turned out okay. When that Samsung drive comes in, I'd like to send a raw stream of a disk from that drive and my Sony drive, if it would help anybody in determining which drive would be the better option for those disks (if that's okay, of course ). I'm sorry for all the questions, I'm still really new to KryoFlux stuff. The only floppy disks I ever used as a kid were always 1440K disks, and I never thought about professionally preserving their contents until much later.